itself using pure gold, which also helps balance skin tone. 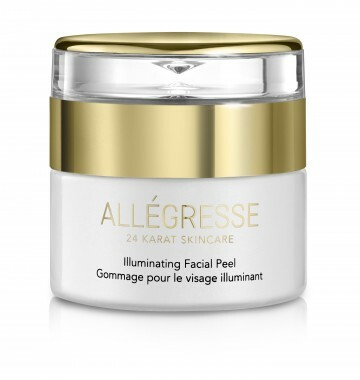 Reveal more youthful-looking skin with ALLEGRESSE Illuminating Facial Peel. This unique exfoliator gently removes dull skin cells and encourages skin to renew itself using pure gold, which also helps balance skin tone. 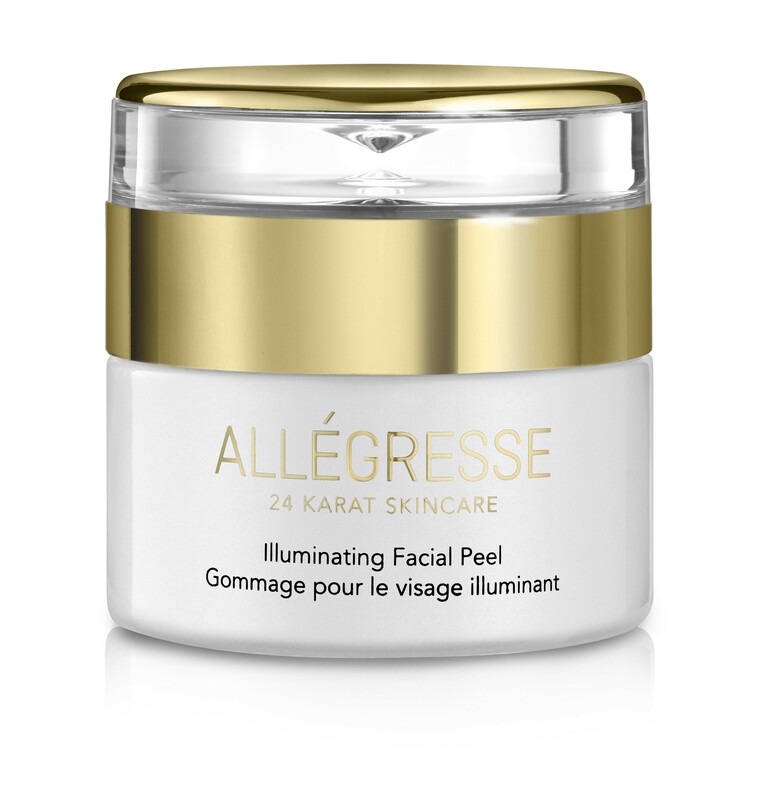 Our peel is enriched with extracts of algae and natural ginseng to revive texture. Borage Seed Oil, Evening Primrose Oil and Pomegranate Extract help fight the signs of early aging. Best of all, this exceptional peel is free from parabens, mineral oil, sodium lauryl sulfate, petroleum and synthetic color. Gold helps skin appear revived. Algae and ginseng extracts help revive texture. Directions: Massage over wet skin in circles, creating a foamy layer. Rinse thoroughly. • Discontinue use if skin irritations occur. Ingredients: Aqua (Water), SD Alcohol 40, Propylene Glycol, Aloe Barbadensis Leaf Juice, Glycerin, Carbomer, Phenoxyethanol, Polysorbate 80, Triethanolamine, Anthemis Nobilis (Chamomile) Flower Extract, Cucumis Sativus (Cucumber) Fruit Extract, Fragrance (Parfum), Algae Extract, Cetrimonium Chloride, Punica Granatum (Pomegranate) Extract, Simmondsia Chinensis (Jojoba) Seed Extract, Camellia Sinensis Leaf Extract, Panax Ginseng Root Extract, Oenothera Biennis (Evening Primrose) Oil, Borago Officinalis (Borage) Seed Oil, Gold (CI 77480).